This business process consultant applies the methods he preaches to multinationals to build road-legal ultra efficient vehicles achieving 100 miles per gallon, in open-source. 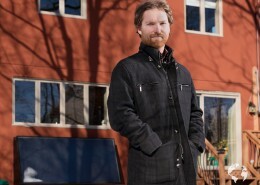 The man who designed and built one of the most ecological, open-source cars in less than three months – it boasts about 100 miles per gallon, while the Clio IV, the best-selling car in France, stands between 29 and 77 miles per gallon, depending on the model – has more to do with a super hero than the cliché of a mechanic. His name, Joe Justice, is reminiscent of a caped crusader. His mission: “to cool down the planet.” On the walls of his garage, in the suburbs of Seattle, you won’t find any pictures of pin-ups or cars. Instead, one may read fragments of his modus operandi pinned to the walls: “Welcome changes positively even late in a project,” “Simplicity – and minimizing unnecessary work – is key,” “Carry out your projects with committed people. 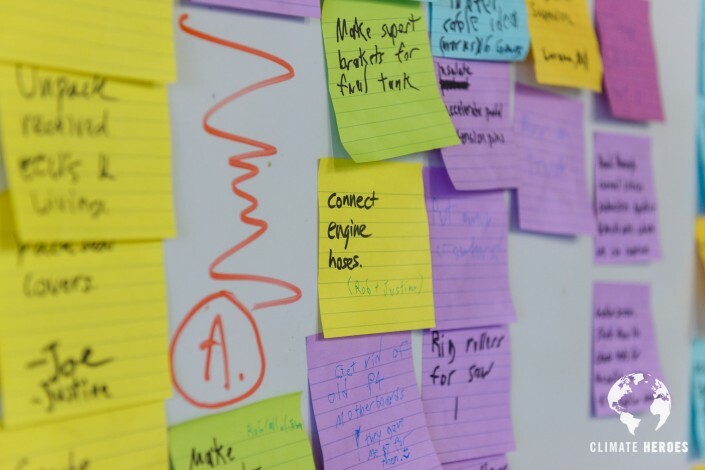 Provide the environment and the support they need and trust them to achieve the goals.” And Post-it notes, loads of Post-it notes. “I was driving a sport cabriolet on the magnificent road between Hana and Hawaii during my honeymoon in 2008, when I realized that if everybody on the planet indulged in the same activity, the pollution levels would become unbearable,” remembers Joe Justice. Soon after, the X-Prize foundation announced a competition that would reward the creation of a road-legal vehicle with a fuel efficiency of 100 miles per gallon. Without any expertise in this area, the thirty year-old registered. “On a piece of paper, I wrote ‘win the X-Prize’. Then I started to make a list of all the steps required to achieve that goal. In no time, I had covered my walls with Post-its,” he recalls. An optimist at heart, he took on each of those tasks with a child’s enthusiasm. Each week, he blogged about his progress and failures. 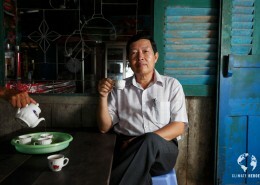 Little by little, Internet users started suggesting changes and solutions to his challenges. Some people even showed up at his door to help him, for free. That’s when he decided to start Wikispeed – wiki, which means fast in Hawaiian, is often used to talk about participative models – a sort of experimental garage, modeled after Wikipedia. In less than three months, the Wikispeed SGT-01, one of the most fuel-efficient cars in the world, was born. Reaching 100km/h in less than 5 seconds, it placed tenth in the competition, ahead of competitors such as Tata Motors, or even… Tesla! Today, Wikispeed’s latest model, the Roadster, can be purchased for $28,000 on the website, including detailed instructions on how to assemble it. 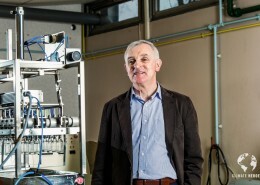 In order to keep everyone organized, Joe Justice, a business process consultant for multinationals such as Boeing, Google and Microsoft, applies the technique he preaches: the « SCRUM » methods (a reference to the rugby pack). 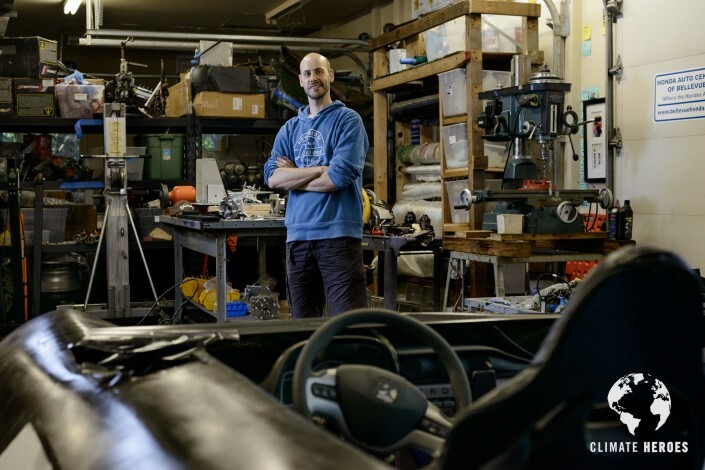 It’s also known as the “art of doing double the work in half the time.” With an ever-evolving team of volunteers, he has continued building more energy-friendly, open-source cars. Invited to participate in “building parties” twice a week, they don’t have to follow lengthy trainings nor do much paperwork.. After signing a liability release, they choose one of the tasks written on the Post-its, ranked by order of priority, and get to work. All can be completed in less than a week, and resourcefulness is the key word. During their time in the Wikispeed garage, Mark Buckney and his 17year-old son, the president of his high school’s robotics club, attempted to put together a lighter car suspension. 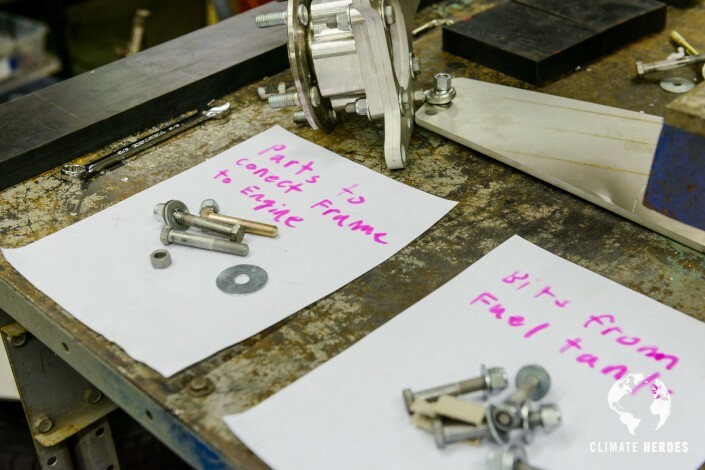 Meanwhile, Abby Connor and Cherlyn Chan, Physics Engineering majors, tried to start a modified engine. Innovation in three areas – the vehicle weight, currently about 700 kg, its aerodynamics, and the car efficiency – reduces gas consumption. When Wikispeed improves an item, the result is shared online for free, according to the open-source model. 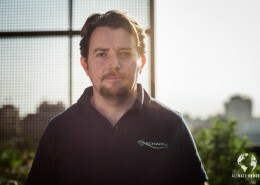 Joe Justice founded Wikispeed as a collaborative and open-source innovation project in order to build road-legal vehicles with over 100 miles per gallon of efficiency. 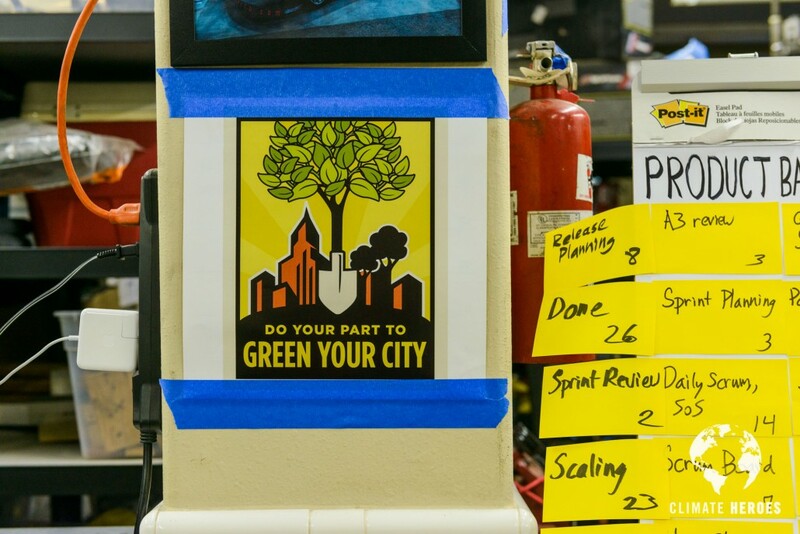 By applying “SCRUM” project management methods, the volunteers at Wikispeed manage to innovate on car prototypes every two weeks, while the industry usually takes up to two years to adapt and change. 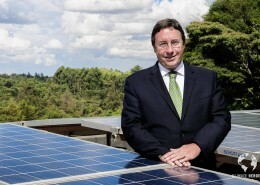 He hopes that their results, available for free online, can be used to influence large car manufacturers to follow this lead, if we are to have the tiniest chance to act upon the ever more pressing issue of climate change. 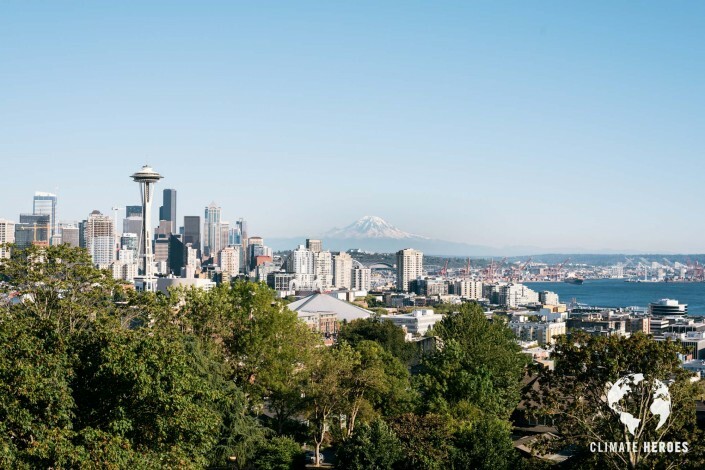 The City of Seattle downtown area and the Space Needle viewed from Kerry Park in the Queen Anne neighborhood. 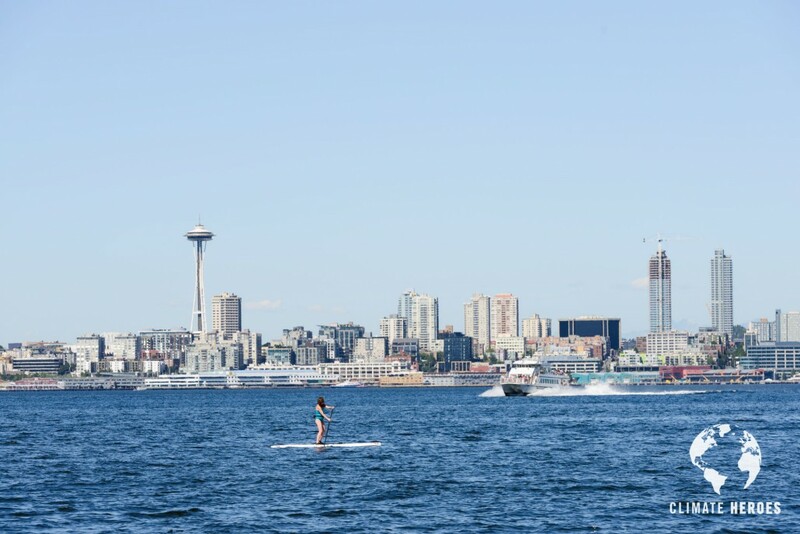 Mount Rainier is visible at the back. Downtown Seattle viewed from Beacon Hill. 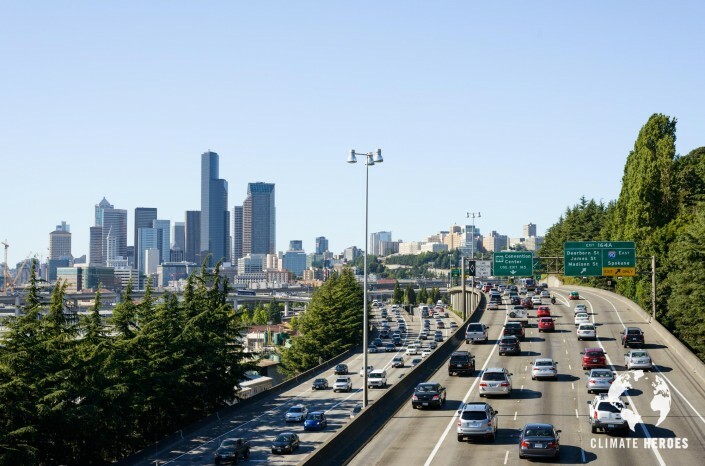 The Interstate 5 highway is subject to a heavy daily traffic across the entire Seattle area. 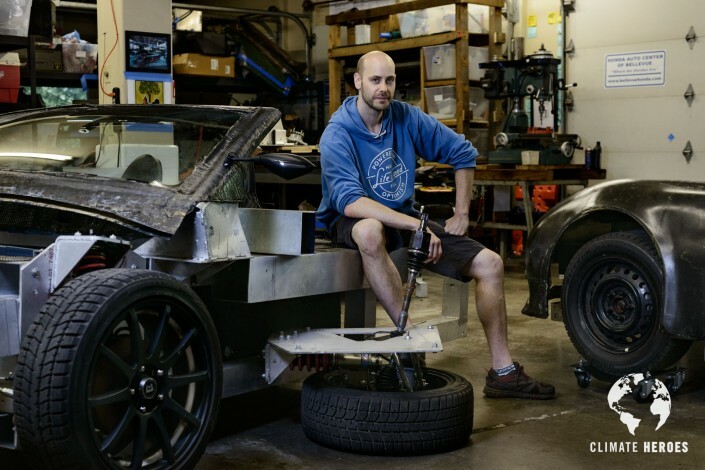 Joe Justice in front of the Wikispeed workshop and two recently built car prototypes in Lynwood, Seattle suburban area. One of the recently built cars in front of the Wikispeed workshop in Lynwood, Seattle suburban area. 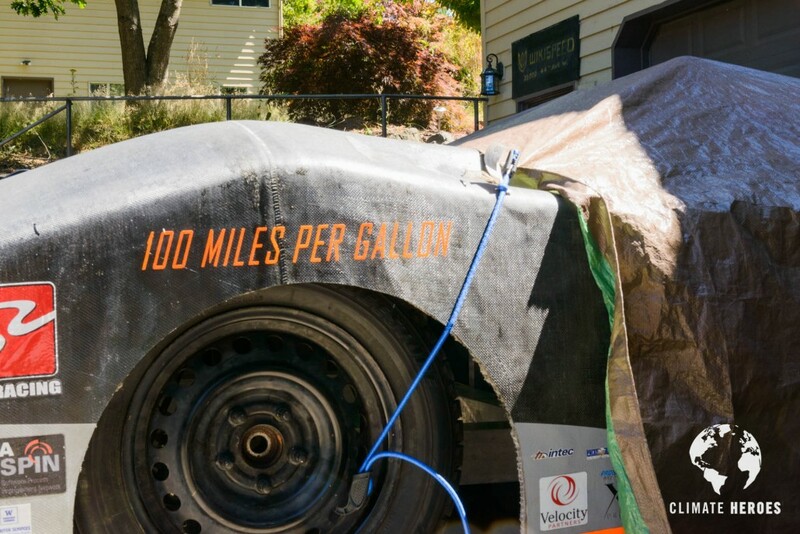 This car achieved 100miles per gallon of gas. 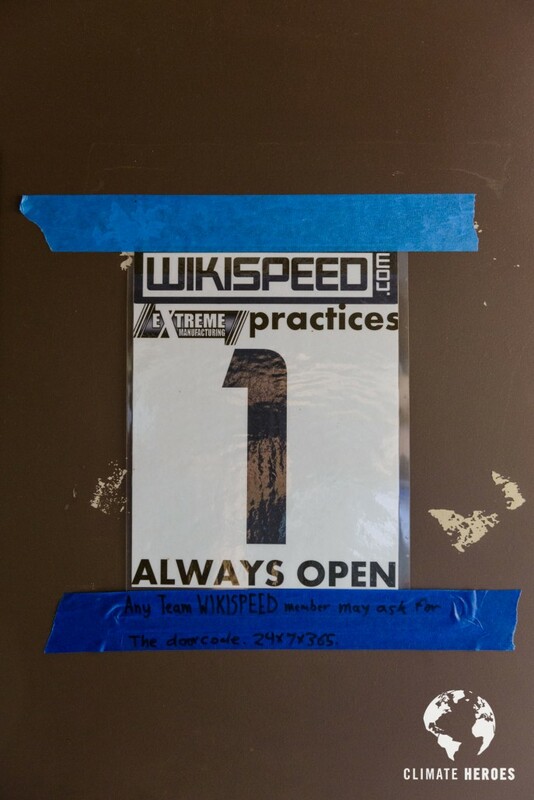 The Wikispeed workshop is open to all of its members 24h a day, 7 days a week. Joe Justice giving a Scrum Training in the Wikispeed workshop. Joe and some students of the Scrum certification training. 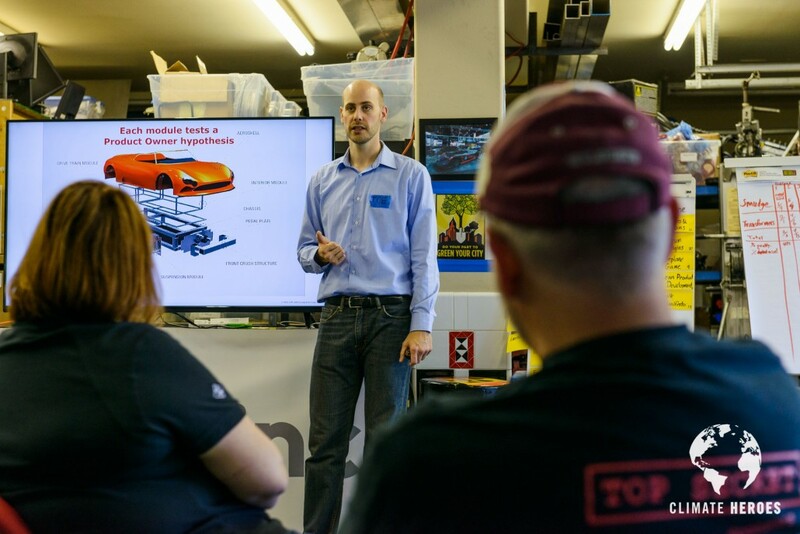 Some hands-on exercises of the Scrum certification training taught by Joe Justice involve testing the agile innovation principles on real projects, like building suspensions for the current Wikispeed car being built in the workshop. 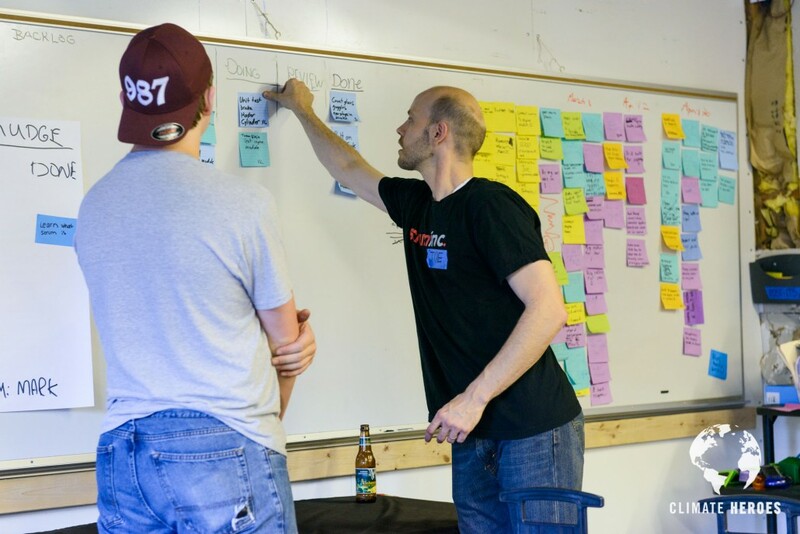 Joe Justice, and Luke, a Wikispeed Build Party volunteer, are examining the To Do list with the post-its outlining the next steps for building the current Wikispeed car prototype. This method is based on the Scrum principles taught by Joe. The Post it board outlining the next steps for building the current Wikispeed car prototype. This method is based on the Scrum principles taught by Joe. 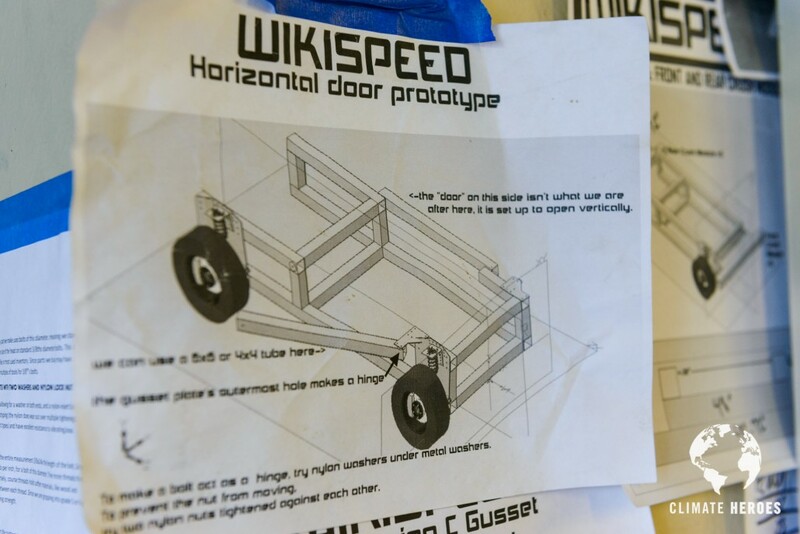 The schematic for a Wikispeed car prototype. 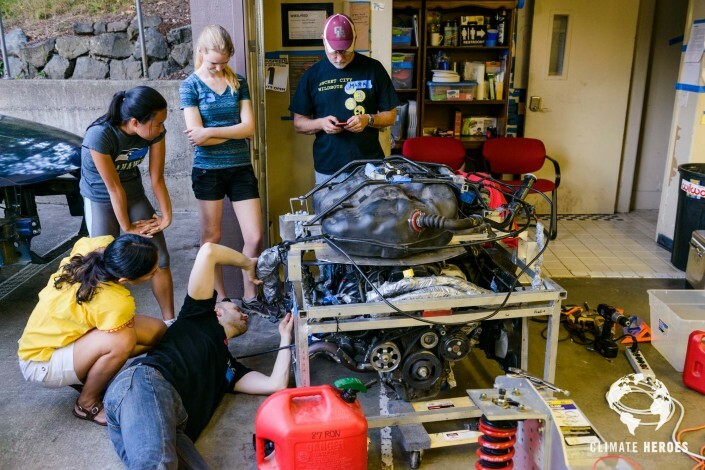 Mark, Lorena, Abby and Cherlyn, volunteers at a Wikispeed Build Party, are fixing the engine to its frame prior to inserting it into the car prototype. Joe Justice looking at the engnine before it is started for the first time. Lorena Ware (yellow), has been coming for about 10 times. A software developer, she comes to learn within a team environment thing she has no idea about. Abby Connor (blond), came for the 2nd time, studies engineering physics and enjoys the hands-on experience Cherlyn Chan (left), Abby’s high school friend, studies engineering at Harvard. 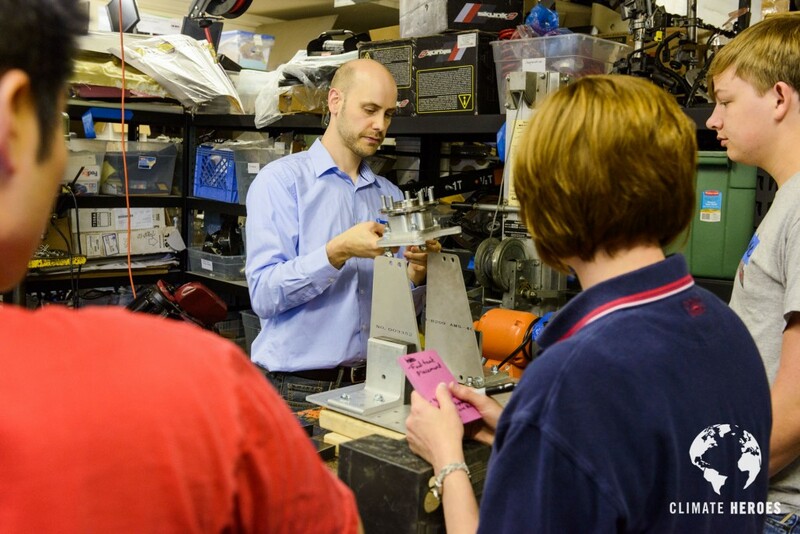 Mark (right) is a volunteer for this Build Party, studies Scrum methods in a training taught by Joe, and is the father of a high school grad who participates in the school robotics team. Ecuador, Going Against the Flow: a new form of conservation? 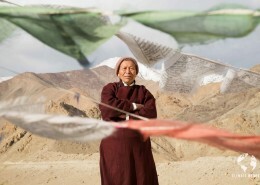 Climate Heroes leader Max Riché speaks at UNFCCC Climate Summit: Video is live! 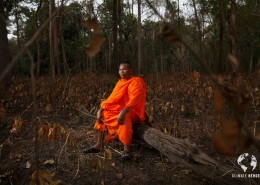 © Copyright - Climate Heroes 2010-2018. All rights reserved.